F.W. Boreham once famously wrote about the grand statue of the beckoning Christ towering over the landscape of Rio de Janeiro in Brazil. Boreham’s deep appreciation for art allowed him to see things that weren’t always obvious to most others. After he moved from Hobart to Melbourne, he would visit the National Art Gallery of Victoria and admire paintings and sculptures for hours. Many of these prolonged moments of admiration resulted in profound essays about things most of us never notice. The recently constructed towering statue of the Christ over Rio moved FWB deeply. 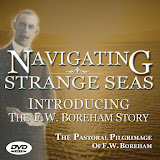 For Dr. Boreham, its significance lay primarily in its placement. It is set atop Mount Cocovada. For those in Rio to observe it, they have to look up. For Boreham this was a reminder that we all too often get caught up in our here and now and fail to see that there is a greater world beyond our little worlds. F.W. Boreham also reflected on how this statue beckons people to come to him – but not just to the top of Cocovada – but to follow Christ beyond the Mountain! Down through the ages, many people have done just that. Christ’s beckoning has led them to go where the language was unfamiliar, the food was strange, the customs were foreign, and the fashion was uncomfortable. Consequently, they have had to learn a new language, acquire new tastes, adopt a new wardrobe, and try to learn the unwritten rules of being polite that every culture takes for granted and considers normal. The statue overlooking Rio, which measures thirty metres in height, and spans twenty-eight metres across its outstretched arms, is called ‘Christ The Redeemer‘. While the hundreds of thousands of tourists who visit Mount Cocovada to behold this artistic marvel read the large sign at the entrance detailing that the enormous statue was begun in 1922 and completed in 1931 and was the collaborative effort of three Brazilian artists, I wonder how many consider the enormity of its name? I guess for many the name sounds like a familiar church or just another one of those meaningless religious phrases? If this is the case, it is a tragic loss for these spectating visitors! A redeemer rescues. A redeemer set captives free. A redeemer helps those who cannot help themselves. A redeemer pays back the debts of another. A redeemer defeats the adversaries who oppress others. A redeemer pays a price to redeem and asks nothing in return. And Christ is the Redeemer! In a world where so many people are lost, hurting, trapped in lifestyles they hate, suffering abuses, being unfairly treated and taken advantage of, couldn’t this world do with some redeeming? ¶ You, however, have followed my teaching, my conduct, my aim in life, my faith, my patience, my love, my steadfastness, my persecutions and sufferings that happened to me at Antioch, at Iconium, and at Lystra—which persecutions I endured; yet from them all the Lord rescued me. Of course, you don’t have to go to Rio to get a sense for the beckoning heart of Christ to people beyond our comfort zone. All you have to do now is go out your front door! It seems that the people missionaries who once had to spend years preparing to go to in learning their languages, cultures and histories are being brought right to our front doors – or at least next door. Even in our church on any given Sunday, we are seeming people to Christ’s outstretched arms have beckoned us to embrace. These are not just the people from far-flung lands who look and speak so different to us, it is also the people who look and sound just like us and yet their lives are broken and hurting and betrayed. These are the people who all too often have found momentary glimpses of relief and escape from a tablet, a needle, a bottle or a bed. This Sunday, don’t be fooled by how many people come through our doors who look like they don’t need a Redeemer. And while we enter into worship, we might like to take a moment to lift our eyes up beyond the distractions of our own worlds and catch a glimpse of the actual Christ The Redeemer beckoning us to look beyond where we usually devote most of our attention, and to realise that those outstretched arms of His – which so warmly embrace us and fill us with deep love, security, and acceptance – are the same arms that also beckon us to come up and look beyond where we’re at.